Open from 9 a.m. - 5 p.m. daily starting May 11. Starting September 3, open 10 a.m. - 4 p.m. on Saturdays and Sundays. Hours are weather-permitting. Alaskan Adventure is a splashgrounds with unique water features. It was also the next step of the Zoo's Master Plan, following the African Grasslands, and will eventually include a new sea lion pool and a home for polar bears. The exhibit is Alaskan-themed, featuring dancing waters through sprays and spouts and over 75 bronze sculptures created by Nebraska’s own, Matthew Placzek. The spraying water is managed through computerized controls, systematically spraying a mix of water and air through nozzles arranged around the sculptures to simulate the water effects made by the animals as they breech, porpoise, splash, spray water from their blowholes and emerge from or dive into the ocean. The centerpiece of Alaskan Adventure is an 18-foot-high humpback whale which has water trailing from its extended fins. A whale’s tail is a separate sculpture and is 16 feet wide and eight feet tall with water flowing from the edge as it appears to submerge for a deep dive. Additional bronze sculptures include: 30 jumping salmon, 25 puffins, 15 sea lions sunning on rocks, three porpoising orcas and three brown bears. Misting nozzles and native Alaskan landscape surround this new area to truly allow Zoo guests to feel like they are in Alaska. 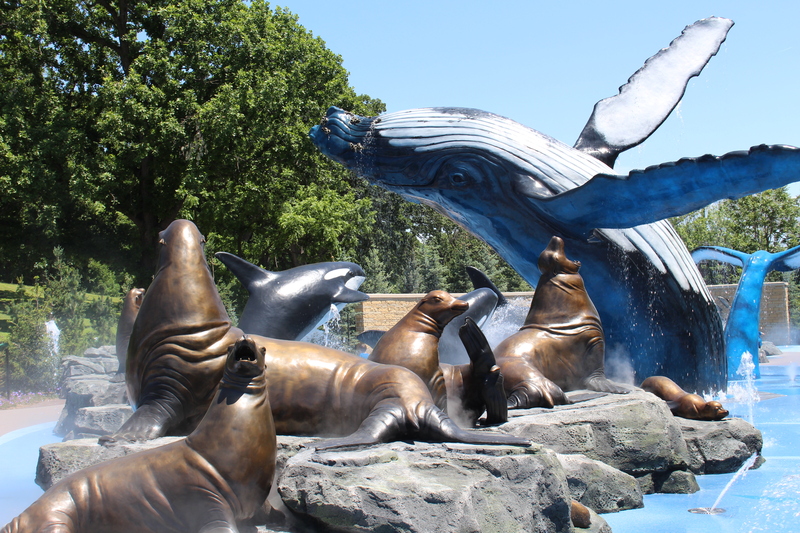 The Alaskan-themed splash ground is a way to incorporate animals and large species that the Zoo does not currently have, and gives kids the opportunity to learn about some of the animals that can be seen near the Alaska coastline. Alaskan Adventure will be located near Red Barn Park and Sue’s Carousel, making this area of the Zoo a hub for kids’ activities. A family changing area is also located near the new exhibit. This exhibit is free to Omaha's Henry Doorly Zoo and Aquarium members or with paid general Zoo admission.